You have sent the requests for your references and transcripts, what is next? Within NursingCAS you can review the status of your application, references, and transcripts directly from the application. After official transcripts have been received and you have submitted your application, the status moves into “Verifying”. If your program requires Full Transcript Entry (tip: check the “Academic History” > “Transcript Entry” section to confirm) the Verification process may take up to 2 weeks. After the verification process is complete, your program status will appear green, with a final status of “Verified”. When items are not required, that information also displays for clarity. For example, when transcripts are not required, the Transcript section displays Transcripts Not Required. 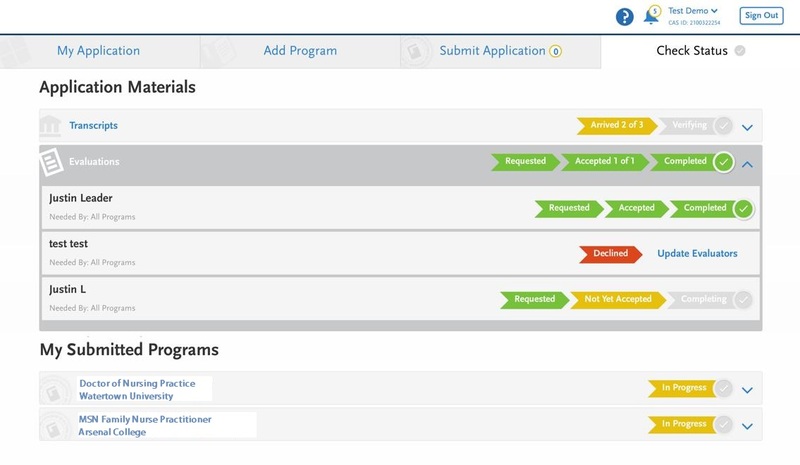 For Undelivered programs, users can click links to “Check your notifications” and “review the program” before clicking the button to Resubmit Programs. On the “Submit Application” page you can also Remove Program(s) you no longer wish to apply to by clicking on the trash can icon. Please note: NursingCAS will continue to process any materials that arrive and will make them available to your designated programs. As long as you have submitted your application by their deadline then your transcripts with your final grades will be available to their admissions/nursing staff as soon as they are processed. Unfortunately, there is no way to tell if your transcripts have arrived until they are processed and scanned. Our operations team processes all transcripts for NursingCAS in the order that they are received. However, we do continue to process them even after a deadline has passed. Please keep in mind that due to the high volume of mail received daily it can take between 7 – 10 days to post a transcript to an applicant’s account. If you have questions about the program specifically and how they review transcripts, we recommend reaching out directly to the school.